The Upper Deck Company broke new ground in June of this year by introducing the trading card industry�s first $500 per pack product with the debut of 2003-04 Exquisite Collection Basketball, a product distributed in 5-card packs packaged in a wooden box. This one-of-a-kind product is geared toward the serious collector looking for unique cards of today's past, present and future stars. Exquisite offers collectors a wide range of unique one-of-a-kind memorabilia, autograph and combination cards. 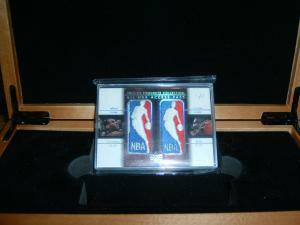 However, one unique insert set immediately caught collectors' attention - the All-NBA Access Pass cards, also known as dual NBA Logoman patches. 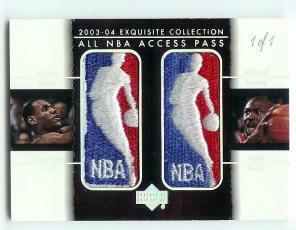 These 1-of-1 combination cards feature the NBA logo patches from the jerseys of superstars such as LeBron James, Kobe Bryant and Michael Jordan. Fueled by national coverage in newspapers such as USA TODAY, The Philadelphia Inquirer, The San Diego Union-Tribune and The Chicago Sun-Times and stories on large sports and hobby web sites such as ESPN.com and Beckett.com, Exquisite quickly created a fire within the hobby and beyond. 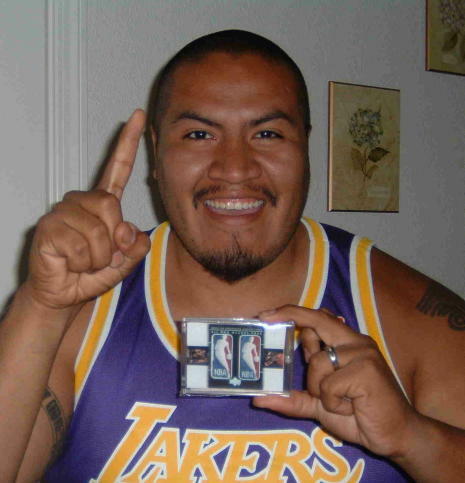 When the Michael Jordan/Kobe Bryant and Kobe Bryant/LeBron James versions of the All-NBA Access Pass cards were pulled and then sold for over $27,000 and $62,000 on eBay during June, prices for packs of Exquisite skyrocketed up to $650 and more as collectors were searching for that elusive key card - the LeBron James/Michael Jordan All-NBA Access Pass card numbered 1 of 1. Then on July 2nd, just 3 days before his 26th birthday, Orlando Macias of Santa Rosa, CA, became the big Exquisite winner. Macias, a Recreation Coordinator and Teen Center Director for the City of Novato, CA, has worked with teens for a number of years, even establishing the Teen Center in Windsor, CA as a teenager himself. He comes from a large family and has been collecting for over 15 years. "My older brothers hooked me on the hobby and I have not stopped since. Basketball is my sport of choice, but I like to collect rookies from all sports. I, as well as my family, are diehard fans of the Los Angeles Lakers and players like Kobe Bryant, Shaquille O'Neal and Magic Johnson. I am also a huge fan of LeBron James, Carmelo Anthony and Dwyane Wade. These new rookies have caused me to spend more then I ever have on cards as this year was definitely the year to collect basketball." In fact, Macias had spent $1,500 to purchase a 3-pack case of Exquisite from a card shop in Rohnert Park, CA. "Initially, I was upset with the Exquisite product. The first case only had one card worth more than $800 and the other cards from the case did not even come close to covering what I had spent." Macias continues, "Luckily, I was able to buy more packs by selling the one nice card from the first case." Those additional 2 packs were purchased for another $1000 at The Strike Zone in Novato, CA, a card shop in Northern California where Macias is a regular customer. After spending a total of $2,500 on the hot Exquisite product, Macias was still hopeful. "I was standing to lose quite a bit of money. I was looking for a LeBron James rookie autograph, a Carmelo Anthony card or a Dwayne Wade card - anyone that would be worth the money that I had spent to that point." "I did not open the packs right then and there. I took them and pulled over on my way home, cracked them open and, out of frustration with my continued bad luck, almost threw the cards out of my car until I saw the back of one card. I saw LeBron's face and knew it was a good card. I then noticed Jordan's face and thought 'cool, a dual-jersey card probably worth about $1000'. Then I looked at the front and saw the card - the card everyone was talking about. In fact, my dealer had showed me the advertising sheet sent by Upper Deck, so I knew that this card existed and what it looked like, but I never thought I would get it," says Macias recalling the moment he opened the lucky pack to find his pull of a lifetime shown here (click each for larger image). The LeBron James/Michael Jordan (NBA-JJ) All-NBA Access Pass 1/1 card was in a pack along with a Chris Webber Regular Jersey card, a regular Jerry Stackhouse card, a Kendrick Perkins Autographed Rookie Patch Parallel card and an Antonio McDyess Autograph Patch card. The other cards combined to be valued at approximately $75-$100. Macias continues, "If I did not get the card that I did, I would have been at a huge loss. I knew that would not be the case when I saw this card though. I was shocked and in disbelief. I drove home very slowly and even found myself checking to make sure nobody was following me since it felt like I was carrying around $100,000 in cash. I still couldn't completely believe it." After getting home, Macias started describing the incredible pull to his wife. "She didn't believe me at first. Once I went on eBay and showed her the Michael Jordan/Kobe Bryant and Kobe Bryant/LeBron James cards, she almost fainted. She called her parents at midnight to tell them the good news. The next day, I also took a picture of the card back to The Strike Zone to show them what I had pulled out of a pack from their store." He also created scans of the card and took more pictures and then placed the card in a safe deposit box. Macias was a little torn about what to do with this one-of-a-kind card. "I was going crazy trying to figure out what to do with it." After going over the various options, he decided to offer the card for sale on eBay. Macias explains his decision by saying, "I am not so sure about selling this card and that is one of the reasons why I put a reserve on the auction. I figure if someone wants to pay more than I would for the card, then they should have it." The card is still pulling at him though as he adds, "I think to myself, this card is at least worth $100,000, but if I keep it for 10 to 20 years, its value could even triple or quadruple. I can't stop thinking about what might happen and all of the possibilities." After an initial unsuccessful attempt to sell the card on eBay due to a non-paying buyer who had used the Buy It Now option, the card was relisted on July 12th and thirty bids in just over one day quickly took the auction to over $58,000. Click here to view the second eBay auction which ended on July 22nd with a high bid of $150,100. However, the final high bid was below the reserve, so it is unclear at this time as to the outcome of this auction. So, how much is this card worth? Most industry experts, collectors and even Upper Deck believed all along that the Exquisite card that would likely fetch the most in an auction was the one Macias pulled. Early June estimates from hobby dealers and industry price guide experts had the possible value of this rare, 1-of-1 card at anywhere from $10,000 to over $20,000. However, those estimates were made before the other two patch cards sold for much higher than originally expected. Based on those previous All-NBA Access Pass card auctions and the early bidding on this card, there is a strong chance that this card will become the largest single basketball card sale for all modern-era releases, passing the first BGS 9.5 Jordan RC that sold for between $75,000-$80,000. Macias explains his thoughts on the card's value by saying, "I have heard from numerous experts, dealers and other members of the media that this is something with an unknown value. Like all trading cards, it is only worth what people are willing to spend on it. I do have a feeling though that someone is willing to spend a lot just to be able to own this card." He then adds, "I do know that this card is easily worth 100 times more than anything else I have ever pulled. It is definitely in a league of its own. This is the card to have right now. The quality is awesome. Upper Deck put some serious thought into the Exquisite product and this is something that will not be duplicated. Just like the famous PSA-graded Honus Wagner card that sold for $1.265 million years ago, this card is a one-of-a-kind item and part of hobby history. You might even call this the Mona Lisa or Van Gogh of modern sports cards." When asked about his plans following the auction, Macias responds, "About 90% of the money will go to enriching my family's future. Then, 10% will let me continue to enjoy this hobby that I love. I don't think that this is a completely life-altering experience, but I'm not going to complain about any extra money. Plus, all of a sudden, my wife doesn't mind my hobby interest or the money I've spent on it quite so much." This 26-year-old collector from California wraps it all up by adding, "It has been an unreal ride, but it will all be worth it."